Another year and another FIFA game arrives on just about every current-gen platform, just ahead of the graphically boosted next-gen console release. Regular players and fans will both feel reassured that FIFA 14 doesn't change a whole lot from where the series was a year ago. There's no swerve ball here, but at the same time that might bring initial disappointment. Therefore is FIFA 14 the ultimate footie game or does this release hit the crossbar? We'll come right out and say it from the off: after wading through FIFA 14's menu screens - which are lovely and wear the new lick of paint well - and multiple gameplay modes, you can be forgiven for thinking that you could have carried on with last year's edition and saved yourself a few bob. Ultimate Team is nigh-on identical, with the new Legends players arriving only at the end of November when the Xbox One is launched. For now it's a waiting game. The career mode has been treated to a couple of new features - most notably a new global scouting network feature which puts to bed the realism-spoiling player search functionality of former years. And we like the way that you can now disable the first transfer window when you start a career, meaning you start the game with clubs having their real squads until the January window, stopping ludicrous computer player purchases in the process. But essentially, there's little to really grab the attention from the off. Until you get down to play, that is. There's the saying, "The devil is in the detail", and that's the case with FIFA 14. Seemingly small alterations to the graphics and gameplay engine add up to quite a different game experience. Watch the action unfold from behind a player and you might miss the intricacies of each difference. Play the game yourself and you'll soon realise that every refinement improves the way the game moves and plays so much that this is indeed a successor worth investing time and money into. Take Pure Shot, for example. Players' shots are based on balance, on angle, the proximity of other players. They will use the outside of a foot to get a certain curl or dip, and it just feels so very very good. The new technology allows players to set themselves and shoot in a way that has never been possible before. Then there is the new ball physics engine, which, when combined with Pure Shot, adds even greater and more realistic ball movement during a hit. Previously, it just wasn’t possible to emulate a Christian Ronaldo or Gareth Bale dipping freekick in a FIFA game. Now you can. We found out ourselves how satisfying these new technologies can be to see and interact with in full force. Using Luis Suarez in our very first match of the finished Xbox 360 version, we cut inside an Evertonian right back, and hit the ball with the outside of our right boot. It looped, dipped and spun over the outstretched arm of a diving Tim Howard and cannoned off the cross bar. It wasn't a goal, but it might as well have been given the emotional response it triggered. The other very important new technology in FIFA 14 is centred on player animations. Called "Precision Movement" it effectively turns small, virtual lumps of digital clay into moving, breathing footballers. Where there were limited animations for each player before, there are now many more steps between animations and they are determined by more factors and statistics. A player with a slow turning ratio in real life, for example, will deliver exactly that visual experience on the virtual pitch. While a small, nimble player will be able to spin fast and zip up the field. Players also now have intertia, and even when you're not controlling them directly, they move in a more realistic fashion than before. While this looks nice, it also has a radical impact on gameplay. You will find yourself relying more on certain players for certain actions. And your pre-match team planning actually becomes much more vital to get right. We also like that FIFA 14 has simplified the process of pulling off skill moves. It's put them on the right control stick, so you don't need to be an octopus - no mention of Paul the octopus, please - to pull off some of the best skills in the game. You still need to figure out the correct timings and use them sparingly, but it enhances even the more casual of a FIFA gamer's ability. If we have one gripe over the on-field shenanigans, it's that the graphical models have barely changed in a few generations. They still look a little too plastic moulded. But there are some great touches too, such as animated photographers around the pitch, and managers that come out to their technical areas. We know that the next-generation console versions take things a bit further and add even more animations and graphical flourishes, but we wouldn't mind seeing the pitch get scuffed up a bit during a game in FIFA 14 current-gen, or the players a bit muddy here and there - surely the Xbox 360 and PS3 are capable enough? In football vast sums of cash change hands during the transfer window. 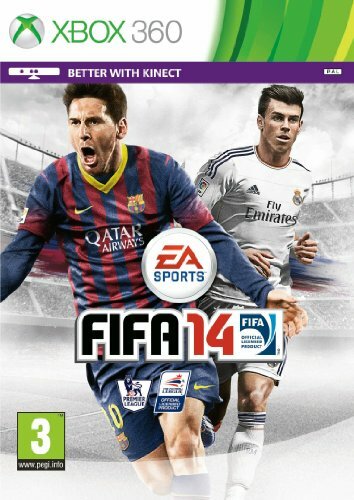 In FIFA 14 there's the £40 cover price and, should you be easily tempted, in-game transactions are also available. But that's nothing new to veterans of the series. You can happily exist within its confines without needing to spend another penny. Some will wave a red card in protest that you can buy into skills and kits without earning them, but it's an all too typical shortcut route that Electronic Arts, the game's publishers, have begun to push into its games. There's a City vs United debate to be had here, sure enough, but rest assured that even if you do bite then you won't end up paying out Gareth Bale levels of cash. Going up this season, however, is that FIFA 14 is the first game in the series where you no longer need to buy an online pass to play multiplayer or download content. So it's not all money grabbing these days. That's the thing about FIFA 14: it's very glossy, character models and all. Plastic yet fantastic. The new presentation of the user interface, which apes somewhat the Xbox tile-centric home pages, adds to the glamour, but it's the in-game action that saves this iteration from just being a kit and transfer update. On the field it feels fresh once again and you have to wonder where it is going to end. Electronic Arts, the game's publishers, will continue to innovate and find other game technologies to help improve realism even further, but this is a game and there has to be a line between what feels right for football and what feels right to play with a controller. FIFA 14 has found the best balance yet. It's not perfect though - we won't dwell too much on the debate over micro-transactions and in-game items bought for real, hard cash - but it is still the best football game out there by a country mile. Whistle blown, final scores in, and FIFA 14 feels like a rip-roaring sucess; the ultimate Saturday session. It's a game that will keep you coming back time and time again throughout the season. Now there aren't many games you can say that about.